I will begin on the morning we called in at Vietnam and large numbers of guests headed off on various excursions. Having done the Ho Chi Min city tour a couple of years earlier on the Asia Cruise, I decided to stay on board and enjoy the relative quiet of the ship. 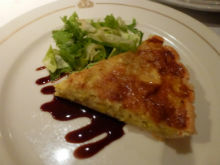 I thought I would enjoy a leisurely breakfast and lunch in the Britannia Restaurant, instead of my usual dash through the Kings Court buffet to eat fast and get to a dance lesson or a workshop. 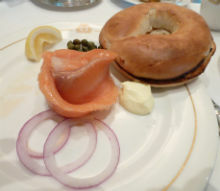 For breakfast I enjoyed a lox and bagel dish. I wanted to compare it to the robust lox platter I had just recently enjoyed in Toronto at Caplansky’s deli. The Cunard version was definitely more – delicate – shall we say. But it was more than enough for me. I spent an enjoyable morning up in the deserted Queens Room, getting a lot of writing done. When I felt I was stiffening up from sitting too long I pulled out my little MP3 player, put on my dance practice shoes and had an excellent dance workout on the ballroom floor. Some energetic cha-cha, samba, jive to get the blood flowing, and then waltz and bolero to focus on balance and strength. Oops this is supposed to be a food log, Back to sipping and supping. 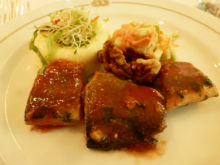 Later I went back to the Britannia restaurant to try out their lunch menu. My attention was first caught by the menu item - herrings with apple-carrot slaw and sour cream flan. I know many people shudder at the word herring, just as I do at the thought of cilantro, but confess to an addiction to pickled herring dating back from early childhood. Weird, right? Anyway this was a different and interesting preparation. Fortunately it did not trigger my herring-binge impulse. 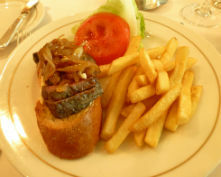 Despite my no-bread resolution I thought I would try the open-faced steak sandwich with sautéed onions and French fries. I asked for it to be medium rare and to my surprise had to sign a health form that basically said I understood the risks of not cooking steak to a dried out cinder! Well, that’s not quite what it said. But it was a surprise to have to sign a sort of waiver before ordering. After the lox and bagel, and then the steak sandwich for lunch, by the time I joined my group for dinner that evening I was not too hungry so I decided to stick to a couple of appetizers. 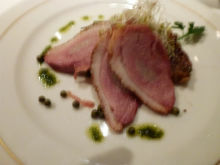 My first pick was the smoked Magret duck breast with green peppercorns and grilled figs; very nice; and then the caramelized leek and goat cheese tart, citrus and white truffle oil which I found a trifle bland. 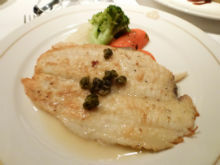 One of the mains that night was the pan seared lemon butter sole with caper lemon butter sauce, pictured above. Friday was a day at sea, en route to Bangkok. We had a dance workshop - cha cha cha – then I had back-to-back dance lessons. By dinnertime I was feeling muscles I did not know I had – should have probably studied harder in anatomy class and was quite hungry. 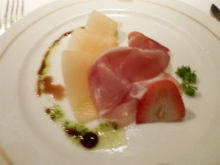 My appetizer selection was Prosciutto ham and cantaloupe melon salad. 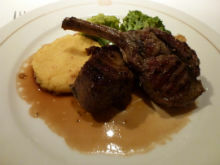 It was followed by the grilled lamb chops with pomegranate molasses, grilled polenta and roasted fennel. I found one of the chops cooked to perfection but the other was definitely overcooked. I liked the roasted fennel but the polenta was not particularly appealing. 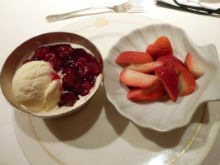 For dessert I was just going to have a small dish of strawberries but I could not resist tasting the Cherries Jubilee and vanilla ice cream. Very nice. On Saturday we were docked in Laem Chabang, the port for Bangkok. Our Asia cruise had terminated in Bangkok last time and I spent several days there after that cruise. Again I chose to stay on board and enjoy the quiet of the ship. I had breakfast in the Britannia restaurant. 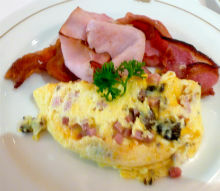 I thought I would try their breakfast omelet, and decided to try bacon on the side. They had three kinds, English bacon, Canadian and American. Hmmm…. On consultation with the waiter, we decided that a bacon taste test was necessary so he brought me a piece of each kind. Interestingly enough, the English bacon won out. They must have had a low-salt variety of the Canadian bacon, which would normally be my choice, as it was dreadfully bland. So this is a sampling of the food I have enjoyed on board during the first week of the cruise. Fortunately with the dancing my clothes are still fitting. At least I think so. I left my jeans at home. Those are usually my test item for how well I am doing with controlling my eating while away. Any way, let's see how I fare as the cruise continues and the temptation to indulge increases.